A Palestinian youth has been killed by Israeli forces in Ramallah in the wake of violent West Bank clashes that erupted after an 18-month-old toddler was killed in an arson attack in Duma yesterday morning. According to Palestinian medical officials Laith Fadel al-Khaladi, 17, from Jifna, a village near Ramallah died early on Saturday after he was shot by Israeli sniper fire during clashes at Atara checkpoint near Bir Zeit . Israeli forces said he threw a fire bomb at a watch tower. The teenager was taken to a hospital in Ramallah where he died overnight. Two Palestinians have been killed in the past 24 hours after the fatal arson attack that killed Palestinian infant Ali Dawabsheh that also left his parents Reham and Saad with third degree burns over up to 90% of their bodies. His four-year-old brother also has burns over 60% of his body. They are all being treated in an Israeli military hospital near Tel Aviv. Earlier on Friday Mohammed al-Masri, also 17, from Gaza was killed by Israeli army fire as he reportedly approached the border fence during a youth protest against the fatal arson attack that killed West Bank infant Ali Dawabsheh. According to the Israeli Defence Force, soldiers fired twice at Palestinians approaching the border fence with Israel in the northern Gaza strip. The army said at first Palestinians approached the fence and were 30 metres away. Israeli soldiers tried to stop them getting closer by shooting into the air. The IDF said it then fired at two men who did not leave the area near the fence, claiming they aimed below their waistline. The men then moved away from the fenced area separating Gaza and Israel. Israel forces fired a second round of fire after they said five Palestinians threw stones at the border fence. The IDF said they fired at the legs of the protesters. Mohammed al-Masri was killed during the second round of fire. Dozens of other Palestinians were injured in clashes across the West Bank yesterday. Another Palestinian youth in Hebron was shot in the leg during violent protests and another four were injured when the IDF fired tear gas and rubber bullets at stone-throwers near Halhul in the West Bank. Clashes broke out overnight in East Jerusalem. 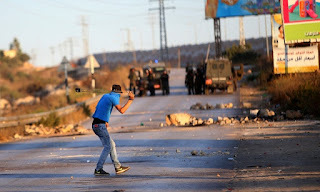 In Shuaafat refugee camp another Palestinian was seriously injured with a rubber-coated steel bullet allegedly fired at his head and another 11 were injured during clashes. In Beit Hanina fire bombs were thrown at Pisgat Zev, a Jewish settlement with over 50,000 residents. The Palestinian Liberation Organisation said it would take the Israeli government to the International Criminal Court over the death of Ali Dawabsheh. In a statement the PLO said it held Israel’s government “fully responsible” for the death of the 18-month-old boy. The death of the toddler was condemned locally and internationally with Israeli officials visiting the parents in hospital. Both Palestinian president Mahmoud Abbas and Israeli prime minister Benjamin Netanyahu called the attack an act of “terror”. Abbas said he had ordered his foreign minister to file a complaint at the ICC in the Hague. The Hamas government in Gaza also condemned the attack and called for a “day of fury” in response.